Every time there is an act of terrorism the Far-Left and their allies in the media immediately launch an attack on the rights and liberty of non-terrorists. The latest example of this totalitarian urge on the Left is the campaign against “bump stocks” that began after the attack on the Las Vegas Route 91 Harvest music festival that left 58 concert-goers dead. The FBI has been strangely silent on the motive and background of the allegedly lone killer, reclusive high-stakes gambler Stephen Paddock, who somehow managed to transport, again allegedly by himself, a large arsenal of weapons to his room on the 32nd floor of the Mandalay Bay Hotel, all without arousing a squeak of suspicion. Authorities claim that without naming names there are potential charges against others as a result of the ongoing investigation. What those charges might be or who might be charged remains elusive, but “bump stocks” have already been indicted, tried and given a death sentence by the media and Leftist legislators. You can submit a comment opposing the regulation of bump stocks through this link. The first to act was New Jersey’s Democrat-controlled legislature and its RINO Governor Chris Christie, who, in his last act as Governor signed into law a bill confiscating any “bump stocks” belong to private citizens in New Jersey. New Jersey residents now have 90 days to hand over their bump stocks to authorities or else face third-degree charges which carry “a sentence of three-to-five years in prison, a fine of up to $15,000, or both.” Moreover, notes Breitbart’s AWR Hawkins, the new ban also covers trigger cranks, which were not even used in the Las Vegas attack. It is worth noting that the original constitutionally dubious National Firearms Act did not confiscate machine guns, suppressors and other property regulated by its passage, so this is a much bigger issue than banning bump stocks; it sets a precedent for a legislative taking of any and all firearms and accessories. And it is just as bad or worse at the national level. 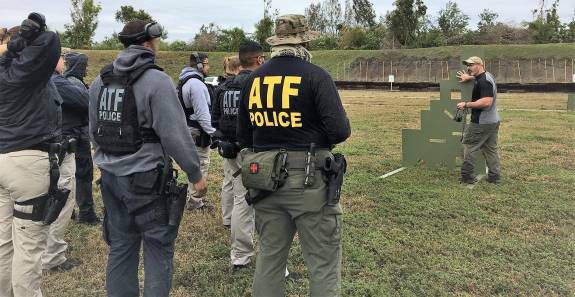 The Bureau of Alcohol, Tobacco, Firearms, and Explosives is considering rule-making to ban bump stocks at the federal level, even though they are clearly legal and beyond the scope of the regulatory authorities set forth in the National Firearms Act. You can submit a comment opposing the regulation of bump stocks through this link. A machine gun is regulated by the National Firearms Act of 1934. The National Firearms Act (NFA) does not ban machine guns; it regulates their sale by imposing a $200 tax and registration scheme. This same legislation imposes a similar tax and registration on short-barreled (sawed-off) shotguns and rifles. The NFA and its attendant taxes are still in force, codified in amended form at 26 U.S.C. § 5801 et. seq. Under 26 U.S.C. 5845(b), "The term machinegun' means any weapon which shoots, is designed to shoot, or can be readily restored to shoot, automatically more than one shot, without manual reloading, by a single function of the trigger. The term shall also include the frame or receiver of any such weapon, any part designed and intended solely and exclusively, or combination of parts designed and intended solely and exclusively, for use in converting a weapon into a machinegun, and any combination of parts from which a machinegun can be assembled if such parts are in the possession or under the control of a person." The “frame or receiver” is the “box,” if you will, that houses the trigger mechanism, hammer or striker, and to which the barrel and stock or grip are attached. This means that rapid fire guns that have a hand crank, such a Civil War era Gatling Gun, or a pump action rifle or shotgun or a semi-automatic gun that loads one round for each pull of the trigger is not a machine gun because they each require one trigger pull or other manual action per shot fired. A “bumpfire stock,” as was apparently used in the Las Vegas attack, does not come within the purview of the NFA because it does not change how the gun loads or fires – it still requires one pull of the trigger for each round loaded and each shot fired. What a “bumpfire stock” does is substitute a mechanical device that transfers the energy generated by the exploding charge in the cartridge through a linkage to the receiver, thereby moving the gun, and in effect assisting the operator in pulling the trigger. You can view a video of how it works through this link. Pay careful attention to the operator’s trigger finger and notice how there is in fact one trigger pull per shot fired. Naturally, after the Las Vegas attack, Democrats and other anti-gun Leftists have called for the banning of the “bumpfire stock,” but this would be a huge, and we believe unconstitutional, extension of the existing scheme of firearms regulation, which remember, doesn’t ban real machine guns or machine gun parts, let alone rapid-fire mechanisms, such as cranks. So why all the confusion between a “bumpfire stock” and the authorities to regulate machine guns in the National Firearms Act? Adhering to the tried and true Democratic strategy of never letting a crisis go to waste, California’s Democratic Senator Diane Feinstein has already introduced a bill to ban bumpfire stocks, however establishment Republican squishes on Capitol Hill didn’t want to take the political heat that passing a bill would entail, so they punted their problem to the Bureau of Alcohol, Tobacco, Firearms, and Explosives to take care of it through a rule-making. The only problem is the rule they want to make is clearly beyond the scope of their authority according to the plain language of the NFA, let alone the Constitution’s Second Amendment.